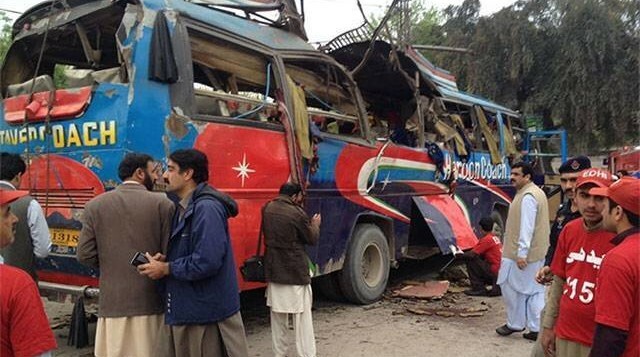 PESHAWAR: At least 15 people were killed and 30 others injured when a bomb exploded on a bus carrying government officials in Peshawar on Wednesday. The attack took place on Peshawar’s Sunehri Masjid road after the bus picked up government employees from Shergarh in Mardan and was transporting them to work in the city. 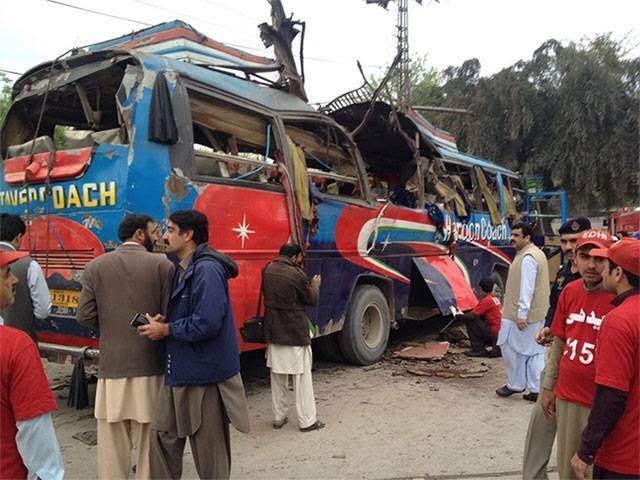 “The bus carrying PDA employees was targeted at at 7:55am,” added DC Riaz Mehsud. Windows of nearby buildings broke due to the impact of the explosion. Residents of the area shifted the injured in their cars to Lady Reading Hospital (LRH), closing the vicinity for traffic. Sources said at least 15 of the total number of injured people at the Lady Reading Hospital in Peshawar were air force employees. BDS officials said 10kg of explosives were planted in the bus, while further investigation was underway. “Emergency has been declared and all doctors have been called in to handle trauma,” hospital spokesperson Jamil Shah said. 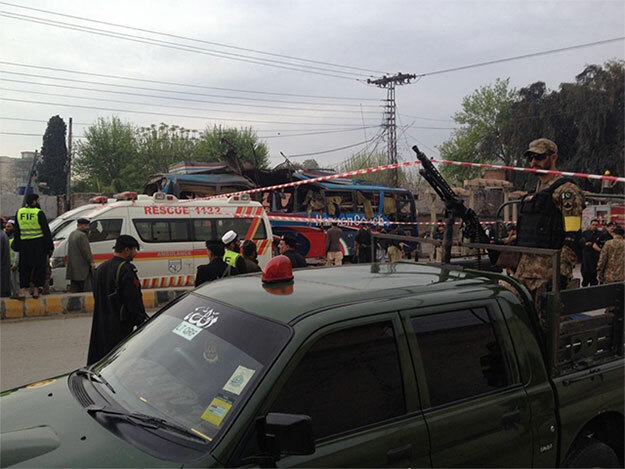 Many of the wounded were in critical condition and the death toll could rise, he added. Prime Minister Nawaz Sharif strongly condemned the attack. According to a statement, he expressed grief and sorrow over the loss of precious lives in the said attack. “These cowardly attacks cannot shatter our unflinching resolve against terrorism,” the premier said. The PM directed the authorities concerned to give best treatment to those injured during the attack, asking the LEAs to hunt down those responsible for the attack. 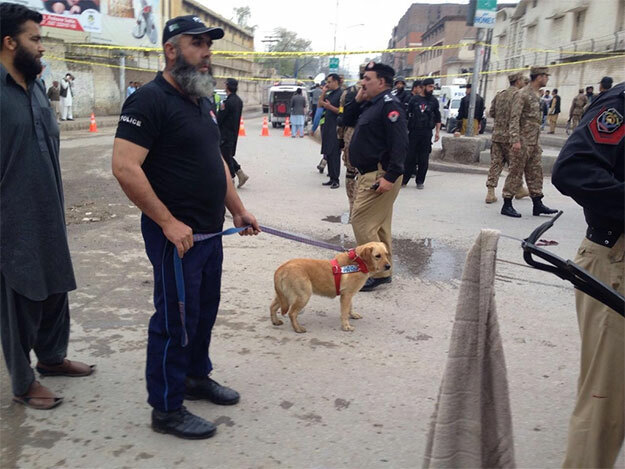 In February last year, at least 20 worshippers were killed and 59 injured in a gun and suicide attack at Imamia Masjid in Phase 5 of Hayatabad. Attacks have fallen since the government crackdown after the 2014 Army Public School attack and the Taliban have been squeezed into small pockets of territory. However, militant groups remain able to launch sporadic attacks on security forces and civilian targets. Two Pakistani employees of the US consulate in Peshawar and some soldiers were killed by a bomb while on a drug-eradication mission earlier this month.